↑ Moore, Keith L.; Agur, A. M. R. (2007). Essential Clinical Anatomy (3rd ed.). Lippincott Williams & Wilkins. ISBN 978-0-7817-6274-8. ↑ McCorry, LK (Aug 15, 2007). 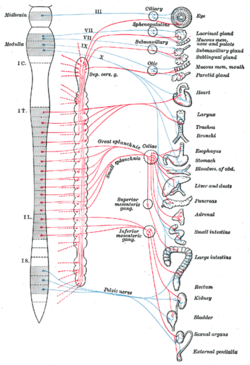 "Physiology of the autonomic nervous system.". American journal of pharmaceutical education 71 (4): 78. PMID 17786266. ↑ "The Vertebral Column and Spinal Cord". www.emery.edu. 1997-08-21. Retrieved 2013-03-21.